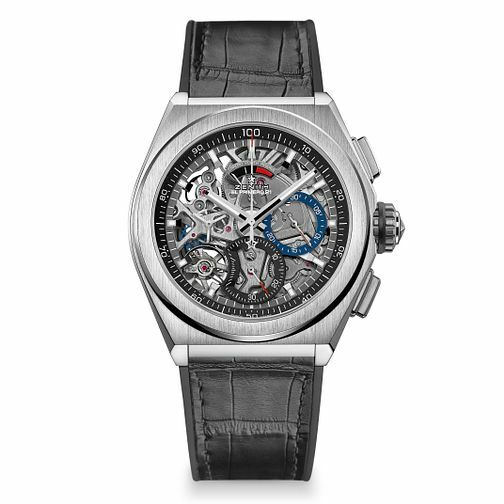 Steeped in horological history, the Zenith Men's Defy El Primero 21 Skeleton Strap Watch is an iconic timepiece that warrants a well deserved place in the collection of any style discerning sophisticated gentleman. Set within a stunning 44mm titanium case, and boasting a solid silver dial, the El Primero 21 is an undeniable quality timepiece. The skeleton design allows wearers to see the intricate detail through the front of the watch. Famed for their expert chronograph movement, the Defy El Primero 21 model boasts a new 1/100th of a second chronograph movement and a exclusive dynamic signature of one rotation per second.